I have mentioned before my dislike of modern shows such as Teletubbies and the way in which they speak gobbledy gook instead of proper language (see the post on The Flumps for more! 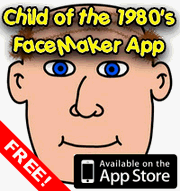 ), but here is a prime example from the 1980’s for which the same could be said. How then can I uphold The Clangers, who also didn’t speak English, yet deride Teletubbies for the same reason? Easy! Firstly, the Teletubbies annoy because they “try” to speak English. The Clangers on the other hand talked in a series of whistling sounds, so there was never any pretence that you were supposed to understand what they were saying. Instead you had the dulcet tones of Oliver Postgate narrating, and the more than obvious actions of the Clangers to tell the story. Like Smallfilms other productions, such as Bagpuss, the duo of Oliver Postgate (writer and narrator) and Peter Firmin (modelmaker and animator) imbued The Clangers with so much character they could keep children enthralled in their adventures (not to mention The Master from Doctor Who). There were 27 episodes made between the years of 1969 and 1974, but I am certain they were repeated many times during the 1980’s as I have fond memories of watching them as a child. 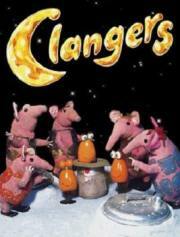 So what were The Clangers? Well, they were small pink knitted creatures who lived on the Moon. None of them had names as such, instead they went by monikers such as Major Clanger, Tiny Clanger, Granny Clanger and so on. It was hard to tell them apart, but you could tell which were male and which were female by whether they wore metal armour (the boys) or a kind of crochet squares cardigan. The Clangers shared their lunar home with The Soup Dragon (and her baby) who lived in caves beneath the surface and cooked soup, which she shared with The Clangers (but only if they weren’t naughty). Also putting in an appearance was The Iron Chicken, who was a bit of an inventor, and The Froglets, weird little orange creatures with permanent smiles and big white eyes stuck on the top of their body. For a wealth of information about The Clangers I heartily recommend a visit to John Fletcher’s brilliant Clangers website. Among the usual fare of episode lists and the like you can find information on how to make your own Clanger (including how to obtain a Clangers knitting pattern) and other assorted merchandise. I certainly remember having one of the Waddington’s jig-saws shown on the site myself! This entry is filed under TV - Kids	and was posted on February 22nd, 2008. You can follow any responses to this entry through the RSS 2.0 feed. You can leave a response, or trackback from your own site.